Have you ever wondered what happened during the time that Simba spent with Timon and Pumba? Now you can find out the answers to all of your questions with The Lion King 1 ½. 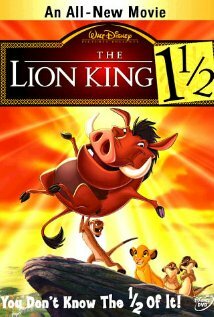 This film centers around his experiences as a young lion with Timon and Pumba. It may even answer some of the questions you may have about the two comedy relief characters. One thing is for sure, there is plenty of comedy, drama, and action in the film for fans of this series to enjoy. You will not want to miss a single moment of The Lion King 1 ½. To find more info, you need to check out http://www.imdb.com/title/tt0318403/?ref_=sr_3. The film gets a five out of five popcorns rating.